Funny! 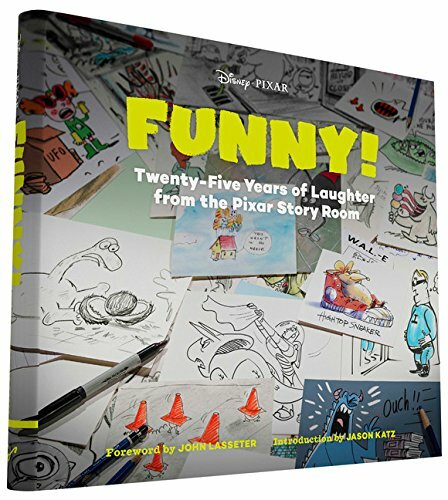 is a book of visual gags from Pixar's story room. With the exception of John Lasseter's foreword and Jason Katz's introduction, the whole book is on the funny ideas and jokes that never made it to the big screen. There are occasional brief commentary by the artists. The book includes all the films right up to Good Dinosaur. I enjoyed going through the book looking at the drawings, which are actually more like quick sketches. Humour is difficult to describe because everyone has a different sense of humour. Having said that, I feel that some of the gags would work better on screen than as standalone gags like they appear in this book. For me, this book's a mixed bag of funny and not so amusing cartoons. It's best that you have watched all the films so that you know the context behind some of the gags. My favourites are those from A Bug's Life, Monsters Inc, Monsters University and Ratatouille. I just feel that they are funnier. The rest of the book are mostly visual gags, not the laugh-out-loud type. E.g. Frozone cools the beer with his breath, Mater with a missile coming out of his month, Wall.E poking at the captain's fat tummy, grumpy Carl holding a bunch of colourful balloons. Merida the bear being launched from a catapult. Spot eating ticks off Arlo's head. They are like those single panel newspaper comics designed to bring out a smile. Overall, it's still an enjoyable collection of work from the story room. However, I don't see it as a book I might read again often.